Hey witches! We're almost to the Halloween season! Today, I have a great collection of Halloween themed polishes for you. Orange crème with a great formula and application. My swatch is shown in two coats. 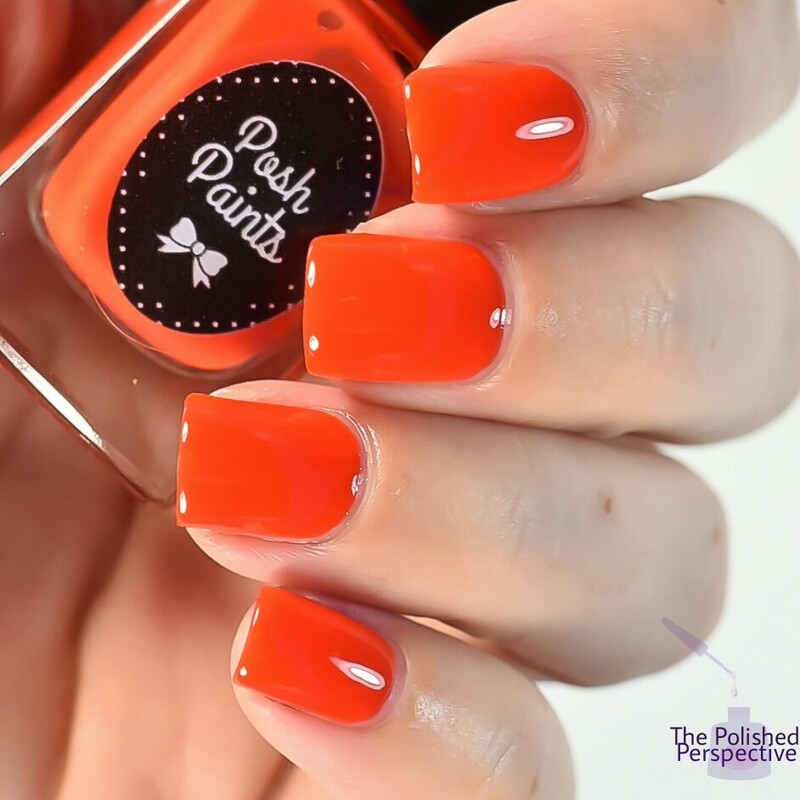 I'm normally not a fan of orange, but this one is really a great shade. It's perfect for fall and it looks great on my fair skin tone. Purple crème. This one also has a great formula and application. If you haven't tried Posh Paints crèmes, you really need to give them a try. They have a great consistency, opacity, and application. My swatch is shown in two coats. 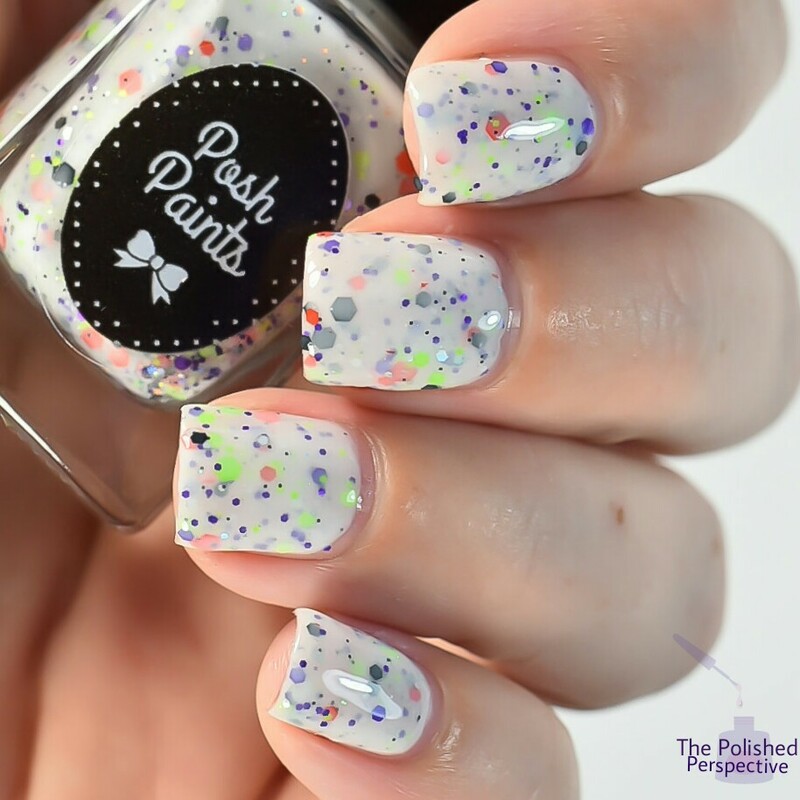 A white crelly with a mix of orange, black, silver holo, neon green, and purple glitters. In my opinion, the mix of glitter and base in this one is perfect. The mixture of glitters is also great. I really love this one. 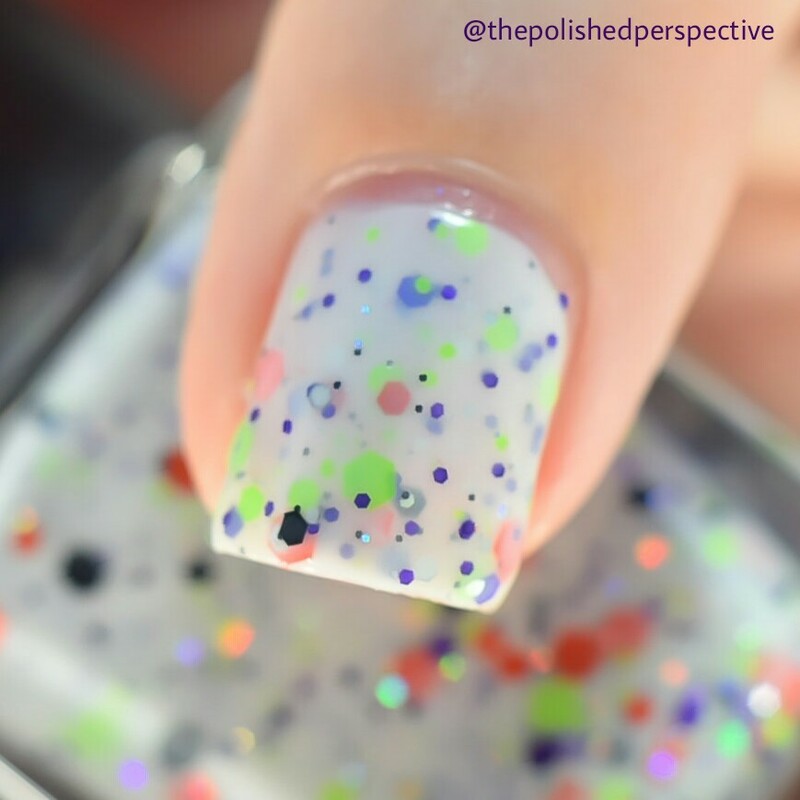 My swatch is shown in one thin coat, one medium coat, one thin coat, plus top coat. Posh Paints does crellies really well. 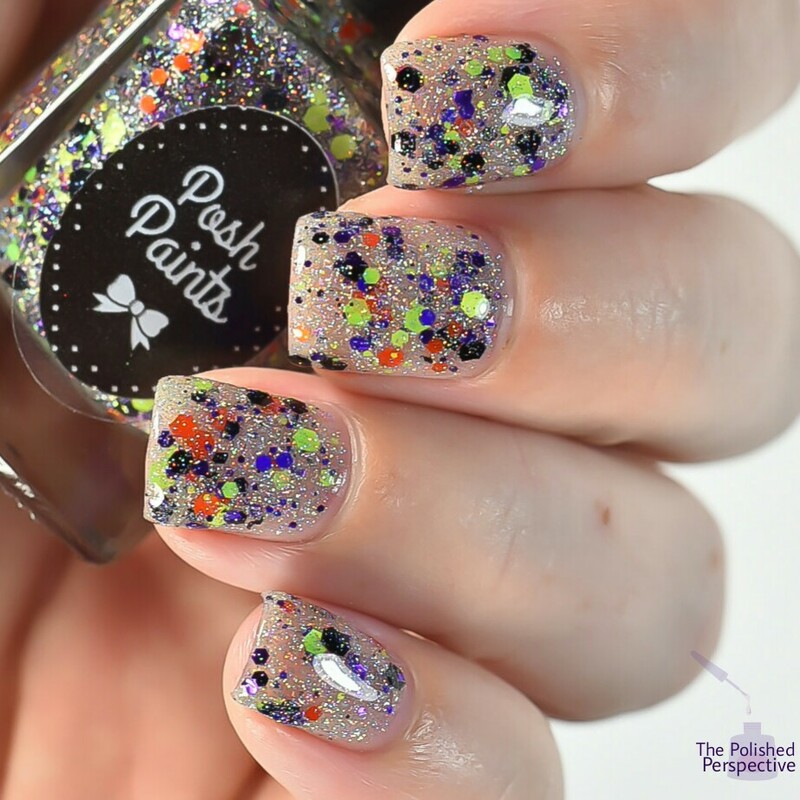 Orange, neon green, purple, and black glitters in an ultra holographic silver base. This one has great coverage and I was able to get full opacity in three coats. If you're light handed with your coats, you may need a fourth coat. Or, you could layer this over a silver, silver holo, or just about anything. 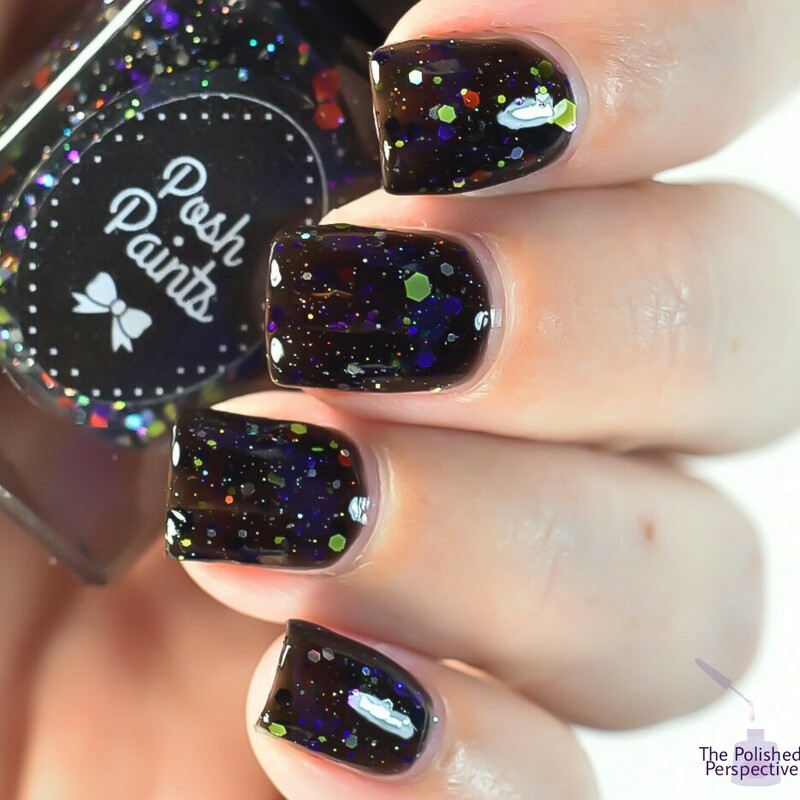 A black jelly base with black, orange, neon green, silver holo, and purple glitters. This one is so awesome. At first I thought, "Black glitters in a black base? Seems redundant." But, it adds a great dimension to the jelly base. My swatch is shown in one thin coat, one medium coat, one thin coat, plus top coat. 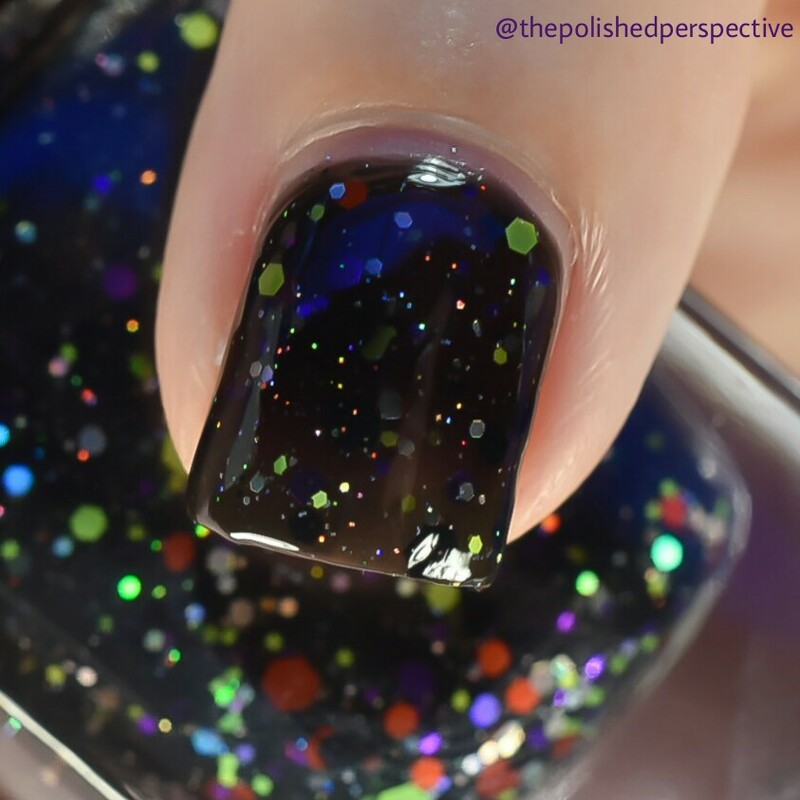 It looks like a Halloween galaxy on my nail! This is such a great Halloween collection. I am going to do so much nail art with these! If you're not big into nail art, but would like something fancier than a one color manicure, combine these. 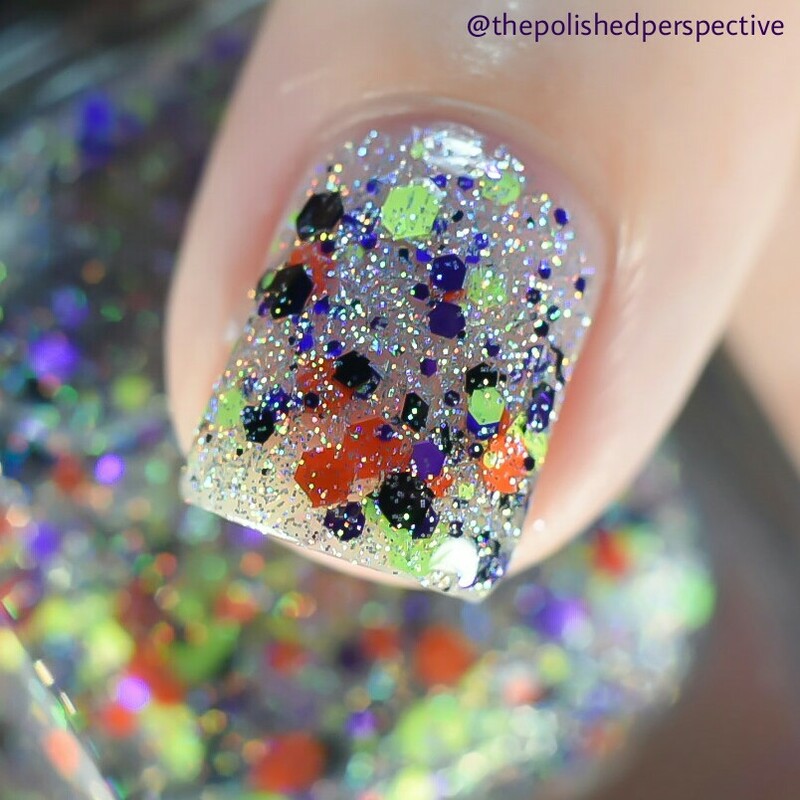 The glitters will pair well with the crèmes for accent nails. Are you as excited about Halloween nails as I am? Gorgeous swatches and collection. That's My Boo is calling my name! Omg these names are fantastic!!! They're all really lovely too! I love how coordinated this collection is! Perfect for Halloween. Yaaaas! The names are adorable too! I actually really like this whole collection. We don't celebrate Halloween in my country, I don't even do Halloween manis when the season rolls round, but I've seen some great polishes come out around this time of year.